This boxed-set DVD anthology brings together three of legendary filmmaker Ken Jacobs' major recent works. 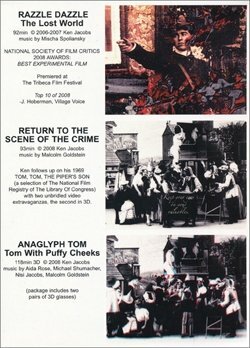 Jacobs explores depth perception and the act of viewing through the application of digital effects and 3D techniques to archival films. Writes Jacobs: "I've been investigating the eliciting of depth effects from 2D films since 1969. Until switching to the computer in the 2000s, many of these effects were created in live performance using a pair of special film-projectors that could hold single frames in their gates - often for minutes - until triggered on to the next. These were of course film-frames recorded and normally projected at 24fps. One might therefore expect screen activity to be unbearably slowed down but such was not the case: the screen was mad with activity, and with an illusion of 3D that could be seen without special glasses, even with only one working eye. I named this apparatus The Nervous System because it was the human nervous system which this vibrating and very physical cinema engaged with. Social observations could be made. Stories of a sort might even be told. But a clear window was not among the illusions I was after. Not after Picasso et al. "Make something happen within the rectangle", their paintings instruct, "the workings of the rectangle is the deeper humanistic event no matter what the subject". The thrill art offers, once the rectangle engages with the mind, is at its best to dip into the madness, familiarize with the howling depths, and thus to extend and strengthen the mind. The two superimposed projections were of the same film but usually placed out-of-sync by a frame or two. An exterior shutter revolving before and between the two projectors had a number of functions. It introduced a crucial interval of darkness and both alternated and visually melded the frames. The screen did not show a going back-and-forth between two distinct frames, two instants in time, but instead presented ongoing and impossibly sustained actions. A door might be seen closing...forever. I called such unimaginable sights, only possible to cinema, Eternalisms. Strange movements and unexpected depths, a strange 3D depending on differences and similarities between frames and the ways they were placed on-screen in relation to each other, the way frames were intercepted by the shutter, and many other factors. Working with wife Flo, live Nervous System performances were presented for 25 years in many places worldwide. Not that we were ever popular; "Why are you doing this? ", more than one baffled viewer asked (mid-performance). Avant-garde, right. As if Hollywood, or anyone, is going to follow in this path, ever! It's individual artist's cinema, I've even taken to calling it Action Cinema (not to be confused with action movies: muscles, car chases, explosions) after Action Painting. Two of the pieces on this compilation revive Nervous System performance, joined by digital possibilities not available working live. expect a battering of light. Flo and I have come to like it. Movies that don't vibrate the same way seem dim and only there to be seen through, necessary when we need to see something at a distance in time or space -the Wikileaks revelations of US helicopter gunners murdering civilians, for instance- but art is something else, another necessity. The third piece in this set is not Nervous System, ANAGLYPH TOM Tom With Puffy Cheeks is straight-out 3D using an early and well-known technique of bouncing two images off the screen one to each eye. The really strange thing here is that the separate views are being lifted from a 1905 movie, TOM, TOM THE PIPER'S SON, a splendid 2D film. We're not blue. The work is appreciated. But 500 DVDs of each movie should do it, no need to kid ourselves. Now what do I think when I lift my thoughts from the computer, in this time of USA throwing its weight around the world and dumping carcasses everywhere? (invading armies, Washington's idea of a jobs program.) Read Chris Hedge's FASCIST AMERICA. Written under Bush it holds true under Obama, while we chumps descend further into The Even Greater Depression."